What I know about Cabin in the Woods: 1.) It was produced and co-written by Joss Whedon 2. ) It was directed and co-written by Drew Goddard, the writer of Cloverfield 3.) It stars Chris Hemsworth. And that's all I need, or want, to know before seeing it. Rarely do I want to go into a film completely blind, but this is going to be one of them. Oh, and I've seen nothing but good ratings for it, but I'm not reading the reviews yet. A cheesy action thriller with a recycled plot and B-List (if that high) actors...I challenge anyone to remember the name of this flick a year from now. Pass. No...just no. I don't think I need to defend or elaborate on this decision. Just NO. This week isn't even a contest - CABIN will handily get my money. I'm also hoping to get to a showing of BULLY sometime soon too. Cabin will actually have to wait till next weekend for me (if then). Brad'll be working tomorrow while Mia, Mom and I soak up bagpipes all day. Hope you enjoy! A quick addendum to your things you know list: Drew Goddard was also a writer for Buffy and Angel. I saw that while I was looking up his resume. Not too shabby! 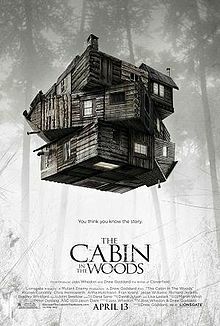 CABIN IN THE WOODS - Everything you expect from Joss Whedon and Drew Goddard, and then some. I love these men. What a great movie. If I could afford it, I'd see it another two or three times. Pushes the envelope, full of comedy, full of gore and thrills, and, of course, good ol' social commentary (without sounding commentary-ish). 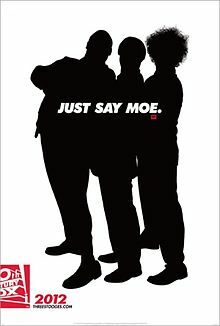 Everyone: go see it. Now. You're making jealous here, Andy! I'm hoping next Sunday will be the day! I will avoid reading anything about it till then. I have no idea when Cabin in the Woods comes out here, which is strange, since it stars a Kiwi (mind you, most people know her from our crappiest daily soap). 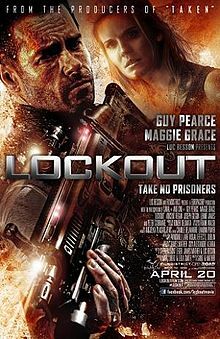 As for Lockout - I love Guy Pearce, but why does he kept getting crap roles? That poster actually scares the living daylights out of me...so much metal! C'mon, Stevee - you ought to know that Pearce's career has been filled with, uh, interesting choices. I've thought he should be a bigger star ever since Memento as well (if not LA Confidential), but he seems content to alternate between small parts in high-profile films and leading roles in movies that most people will never see (First Snow, The Proposition - hey, I've seen both!). I'm just happy to have him around in any capacity. And for what it's worth, he's far and away the best part of Lockout. It's predictably B-movie-ish - neither great nor terrible - but he latched on to the hammy role and cheesy lines and is all buffed up for it. I like seeing him in yet another genre playing yet another different type (cocky action hero? Sure!) even if the film wasn't tremendous. I actually like to see Pearce turn up in the smaller odd roles, like The Hurt Locker and The King's Speech, especially if I had no idea he was in it before seeing it. Not sure why; I'm not a huge fan, but these are the roles of his I enjoy the most, outside of Memento, of course. I accept your Lockout challenge! Test me in a year (since I know you'll remember)! I'll remember if you will :) That's such a lie.